With the holidays upon us, I know we could all use a few new quick and easy recipes to help ease the hustle and bustle that surrounds the season. I know I can! This is a super easy and very tasty meal that is perfect for a busy weeknight or after a full day of shopping on the weekend. 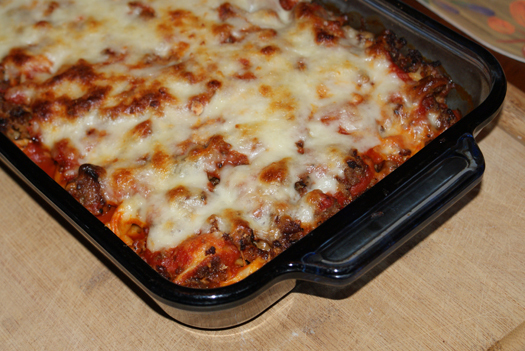 Using packaged tortellini helps to save time and makes the casserole a little extra special! If you add the mushrooms, peppers and onions, it's like the flavors a sausage, pepper and onion sandwich morphed into a baked ziti or a lasagna. At least that's how I explained it to my husband when he asked what was for dinner. Add this one to your must make list this month! And you're looking for more casserole ideas, try my Bruschetta Chicken Bake, Aunt Laura's Broccoli Chicken Casserole, or (one of my most popular recipes) Bubble Pizza! Cook the tortellini according to the package directions. Meanwhile, in a large skillet, brown the sausage and drain off the grease. If you are adding vegetables to your dish, remove the sausage from the pan (reserving a tablespoon of the grease) and saute the veggies in the reserved grease for a few minutes to soften them. Place the cooked tortellini in a 9 x 13 baking dish and top with the sausage, the veggies, the sauce, then the shredded mozzarella cheese. Bake for 25-30 minutes, or until the cheese starts to turn golden and bubbly. Please excuse the crazy bad photo! Sometimes when the fam is hungry and they don't want to wait for Mommy to arrange a pre-meal photo shoot, I snap a quick shot let them dig in. I'll be sure to update with a more appetizing photo next time I make it! What do you do with the sausage ? You spread it on top of the tortellini before the veggies, sauce and cheese. I edited the post!